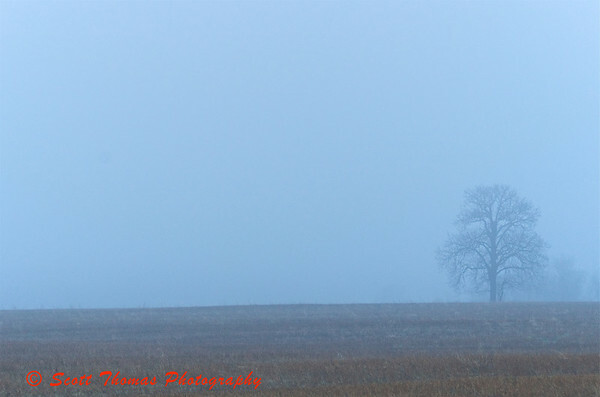 This entry was posted in Nature, Weekly View and tagged field, fog, Photography, spring, tree. Bookmark the permalink. That’s spring in the north country, isn’t it – as the frost lets go of the land and the ice lets go of the water. Soon, soon. Nice moody photo with a great caption. Beautiful foggy landscape. The gentle silhouette of the tree is wonderful. I’m obviously going blind, as I thought that originally said “tree in FROG”. lol Nicely done. Hmmm, I’d say glasses, and then I’d agree with you in any case. However, you have to admit, mine was funnier. I like this blue world. Great feeling and great composition! It definitely pays to get out during “interesting” weather. Nice image. I love fog and the mood that it brings. Fog seems soft and gentle due to its low contrast. It removes sharp lines and shadows and hides the ugly. Fog also reminds me of macro shots by John Gerlach of insects covered with dew after a morning fog. I love the feeling of that! A tree to the right, but to the left, the unknown! This tree is in a field not far from my home. You’ll be seeing more of this tree in the future. I really like fog photographs. Nice foggy capture, Scott, and wonderful quote. Thanks, Anna! Really enjoy what you and Preston are doing on your blog. this is just gorgeous! I love the colors and I love the feeling! !